Miu Miu's metal frame bag in appliquéd leather. 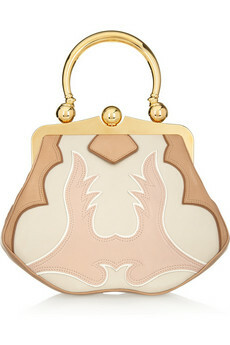 What is it exactly about this seductive bag that makes it so desirable? Maybe it's the combination of the 50's shape and vintage Memphis design with the thoroughly modern, simplistic aesthetic. Maybe because Miu Miu is currently the hottest fashion ticket, and has been for the last few seasons (remember the sparkly Miu Miu pumps, the lifeblood of all hip editors, last Autumn?). Either way, this covetable little number is definitely on my lust list. Ah... That bag is in my dreams already. It's gorgeous.